Have you ever wondered how a 3 in 1 game would look like? 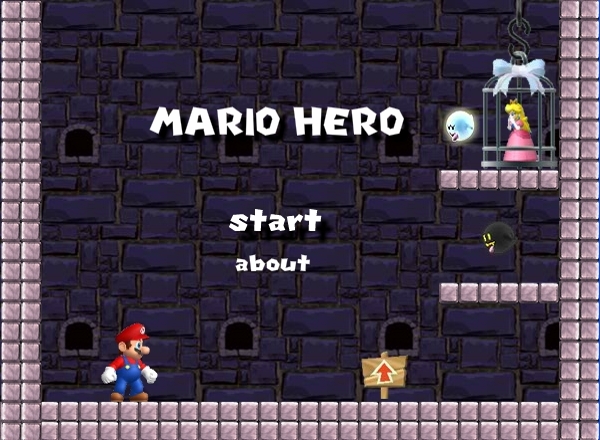 Well here is your answer to this question: In our current flash games review we will talk about “Mario hero”, an outstanding title where you actually play four different games in one. Now let me explain this better to you. Even though there is no story present in the beginning to get you familiar with the mission you have to complete, once the player is faced with the game START menu, you can understand right away what this will be about, once you spot the young beautiful princess locked inside a suspended cage and guarded by Kamek, the flying monster. So let’s follow our game through each level and discover the magic inside. 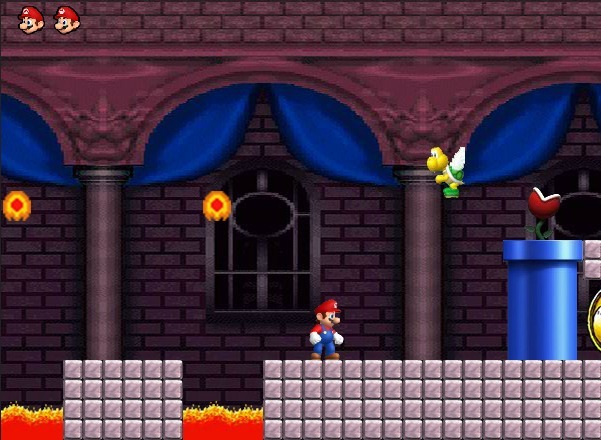 First level is a normal side scroll platform and the action takes place right outside the walls of the the Castle from Mushroom Kingdom where Super Mario starts confronting the new challenges. Flying Koopa Troopa have invaded his peaceful land in order to stop him from rescuing the Princess and they also brought with them many traps to set in his way and a many other new and powerful enemies as well. Special attention is required in order to escape the deadly animated collapsing stones, yet once you get their week spot, by making a forward step to trick them fall and then quickly retreat and cross underneath them once they begin to rise again , the whole job becomes a lot more easier for you. 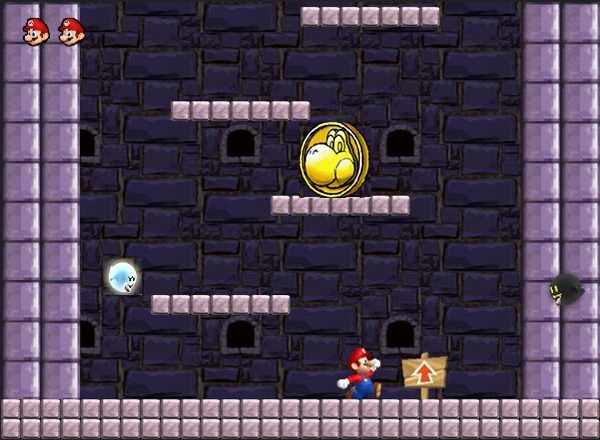 Once you manage to finish the first level by reaching safe to the small minicastle and capturing the flag, second level begins as a total new game. 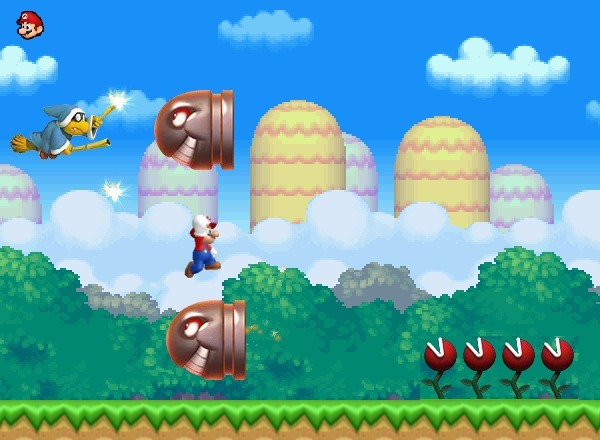 This level is actually a running game where Mario is haunted from the air by the evil Kamek that shoots continuously at him, yet our hero needs to jump over or shoot many other obstacles and enemies both on the ground and in the air.This level will be a lot more harder to beat then the first one so it will require a few more attempts from your side as well as fast reactions, and patience. Once you manage to complete the running course third level come up. 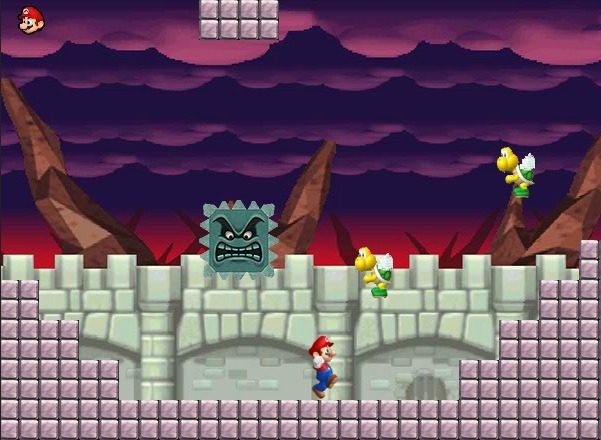 Here Mario managed to get inside Bowser castle dungeons and heads up towards the last floor where his beloved Princess waits to be rescued by him.In the dungeons he must escape many dangerous and deadly traps such as burning lava, rolling stones full of spikes, collapsing walls and of course he needs to defeat all the guardians as well. Reaching fourth level brings a new type of challenge for our friend as he needs to climb to the top of the roof by jumping from one suspended platform to another in a Y axis scroll like game. This time the only escape is up, but to make things more complicated many ghosts are haunting among the walls here so good skills are required to reach the top safe and save Peach and live happily ever after.